"What is this Google Reader you keep talking about and why do you have 900 posts to read?" I didn't discover Google Reader until I happened to click on it about six months ago. I have decided to share what I have figured out on my own. 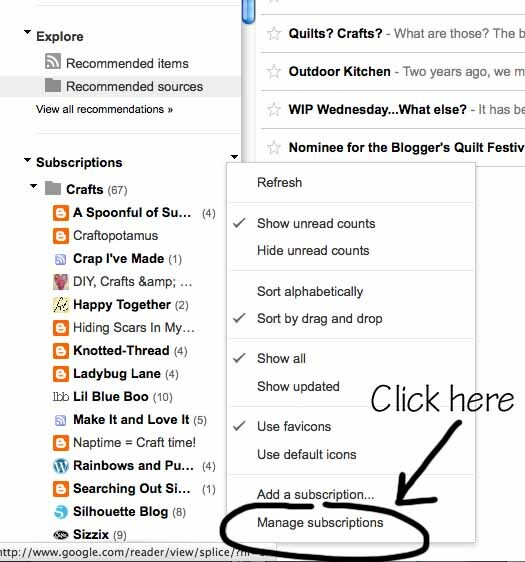 How to organize all the blogs you follow, how to subscribe to new ones that don't have a "Follow" button, and some other cool features! 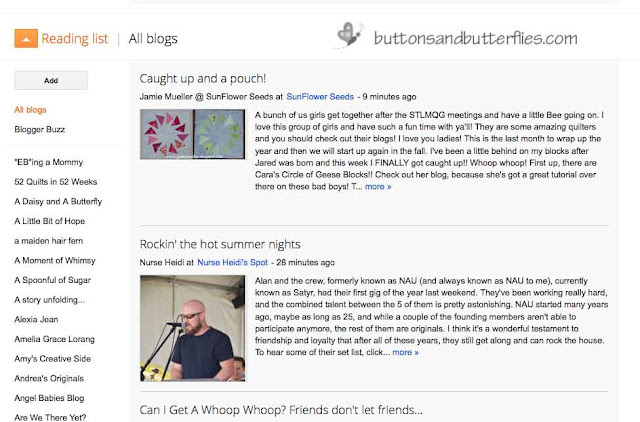 First off, if you were like me, you followed blogs on your Google Blogger page. You would scroll down through them, hoping you didn't miss a blog! And if you were like me? I would miss ALL of the good ones!!! Go ahead...click it...I dare you!!!!! When you do? You will see something like this. You will see the title Blogs I'm following and you will see ALL of the blogs you have been following listed from most recent post on down to the least. Now you could just stop right there and call it a day. When you scroll down each one and read them, they are removed from your reader and you know you have finished them all! But, of course, I have a way you can organize your blogs into folders like these. 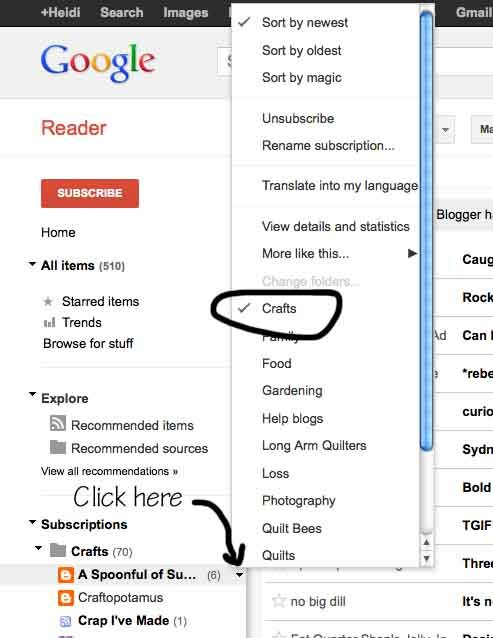 To make your folders, click the little arrow (on the right side) next to the Subscriptions. 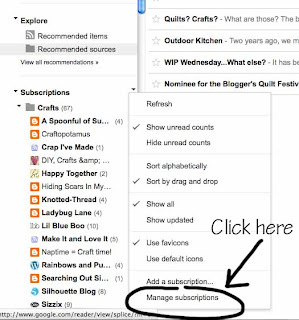 Then click "Manage subscriptions". You will see this. You will notice the top blog does not have any "tag" under it like the others and it says "Add to a Folder". 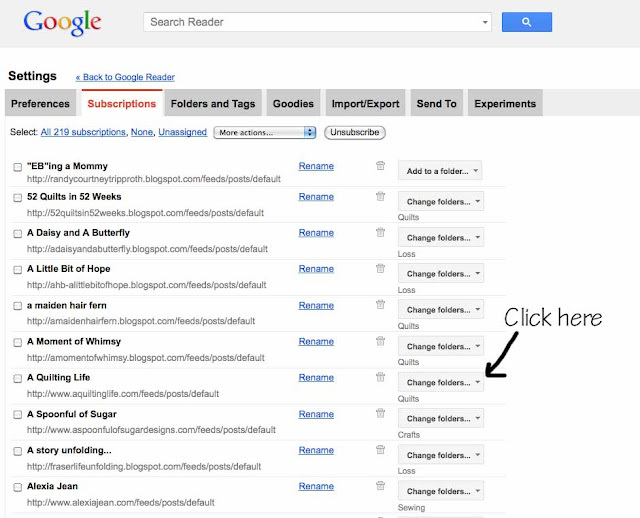 This is how yours will look when you first open your google reader for the first time! Don't worry, easy next step...click "Add to folder" or "Change folder"
There is "New folder..." at the bottom...get busy and start naming your folders. 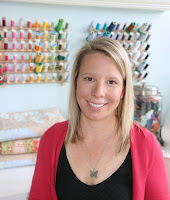 I have just added Long Arm Quilters and Quilt Bees, but plan to add some more this weekend to break up all of my quilt blogs! When you have all the folders named, you simply click the name and a check mark will appear next to it. 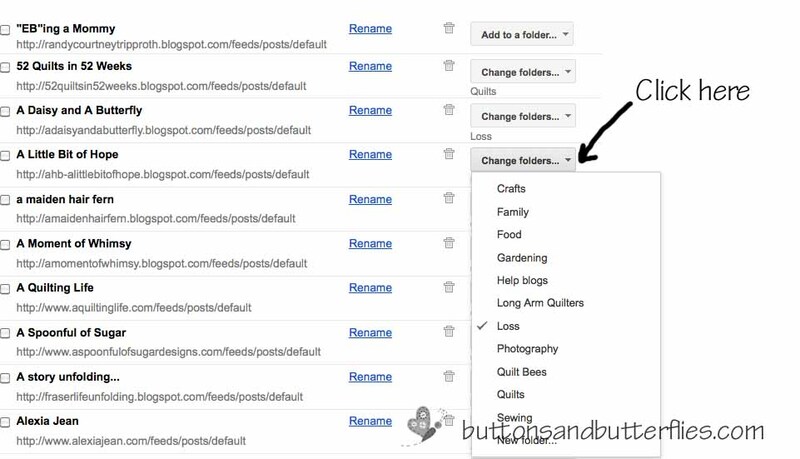 Now when you click on your arrow next to your folder, it will open and you will see all of your blogs that you categorized together. 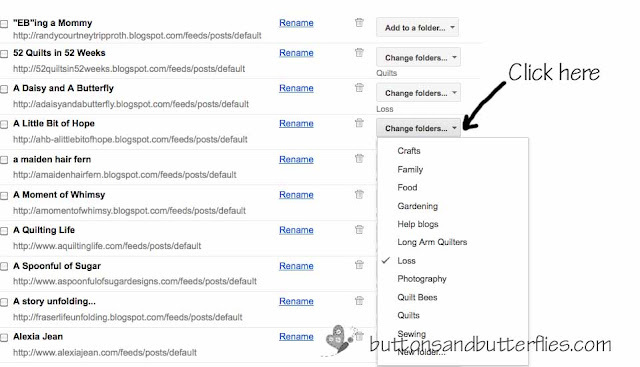 If you aren't sure and want to change a folder, you don't have to go to manage subscription. 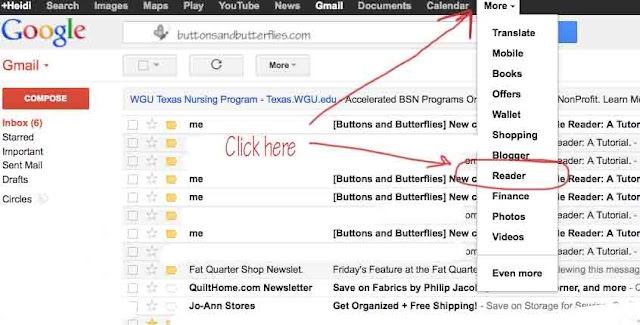 You simply click on the blog arrow on the right and the folders will pop up on the side. Just click or unclick the folder you would like it in! Now...what does this all mean? 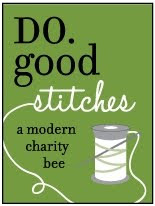 As you click through, each blog post will open. Some bloggers show their WHOLE post in reader, some require you to click on the link (which can be clicked at ANYTIME to see the post on their blog). Fun right? Want to see some more? And you can see the posts in this manner. I haven't quite gotten the hang of it, so I am not quite sure if this works for me...but I plan to play with it a bit more in the future! Is there a blog post that you want to reference again. A tutorial that you really want to make? Want to read a post a bit more thoroughly? Sure, you can use just pin it on Pinterest, but here is another trick. "Star" it! Next to each blog post there is an empty star. All you have to do is click it and it is saved in your Starred Items. Do you ever come across a blog that you just can't manage to find their "follow" button? 2. Type website...no need for http:// or anything. 3. Click the "Add" button. Voile! You are following me. Hopefully this was a helpful post. If something is confusing, please tell me so! If you have any questions? You know where to find me! I'm the one trying to read the 514 posts that she is behind via computer or iPad or iPhone! Don't have Blogger? It's okay!!! If you have a Google account, specifically gmail...you can access it too!!! You just click on the toolbar at the top "More" and then click "Reader". Everyone has a Reader if you have Google. And if you don't have Google, there are plenty of other types of readers through other websites. 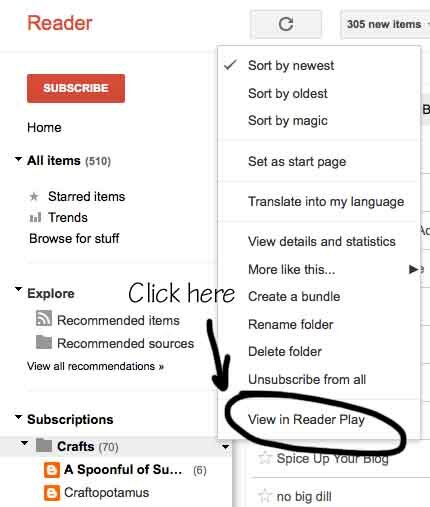 Usually if you click the RSS feed follow button, the options will show up!!! Don't be like me and wait almost two years to figure it out, okay?!?!?!?! I forgot to mention that one too! Thanks Sharon!!! I use that when I am on my phone or iPad!!! I love my google reader, but have always wondered if "subscribing" in google reader counts in the blog owners followers? I started my google reader long before I was a blogger/knew anything about "following" so the majority of the blogs I read I never "followed" them in the traditional sense, only in my reader. It doesn't make any difference to me, but I wonder sometimes when there's, for instance, a giveaway and it says one extra entry if you're a "follower". That is, if when someone follows you in their google reader it shows up as a follower on your blog. Wow, that was a twisty turny inarticulate comment. Anyway, thanks for the google reader rundown, I think a lot of people are missing out! Shannon! Another good question! My understanding (which is very limited) is that it would not show in your follower stats, but you can see how many people subscribe to your blog through Google Feedburner. It tells you how many subscribers you have and other information that is usually beyond me! Hope that helps? If you subscribe manually in reader, it does not count as a "follower" in the Google Friend Connect sense of the word, but I think now that there are many different ways to follow a blog, and with the debacle a few months ago where google friend connect was no longer accessible to non-blogger blogs, the definition of "follower" has broadened. 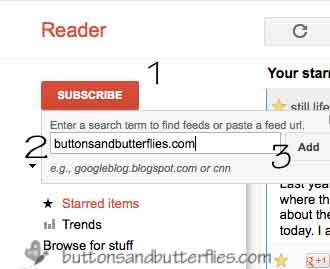 I will often as a blogger when they're having a giveaway if following via google reader counts, and they so far have always said yes. In my comments I will usually say "I follow you via google reader" or something like that! That is a good idea Heather for giveaways! Because some "followers" are via email too! The only problem with the Feedburner, Shannon, is that you can't really "track" who it is following, whereas the Google Friend Connect lets you see your follower's profile! Thanks, Heidi! I have not officially "followed" any blogs before... I would just bookmark them and go look to see if there was anything new. This is great! Yes!! I should have added that you don't even need a blog. You can access it through your Google acct if you have one. I love google reader! I keep my subscriptions pretty simple because I don't follow very many different types of blogs, so I have mind divided into "must read", "crafty" and "non-crafty" Works for me!